Happy Valentine’s Day! It’s the day to celebrate love. What a wonderful idea, well I think so now. I was a bit of a cynic when I was younger I must say, but now I’m all for it. This is because I think Valentine’s Day isn’t just limited to a romantic other, but to everyone special in your life. Your siblings, mum, dad, extended family and your friends! Valentine’s Day is for everyone. When you have allergies you realise how important these other people are, and I’m going to tell you a little story about just that. While I was on holiday in New York City I visited an old school friend, the fashion photographer Phoebe Cheong. We were in Brooklyn and need to grab some food. A deli we were passing looked ok, so we went in. I usually choose something I see as naturally nut free but this time I got a little shy about asking questions about whether a food had nuts in. Then (without me saying anything) she chimed in too! She made sure the shop assistant was paying attention. I have to say it got me a little emotional. I don’t often get shy about my allergy but when I do I’m bawled over when my friends protect and speak up for me. When we were at school together we were always doing something creative, and it usually had something to do with photography and or food. If I were with her right now we’d probably be baking, I’ve even created a recipe in my new cookbook inspired by her. (And we baked it together in NYC, video coming soon s watch this space.) She bakes allergy safe with me even though she doesn’t have any allergies. If she were here now I’d be trying out this gorgeous brownie recipe the lovely people at Splenda sent over. Not to mention, amidst the Peter Rabbit Movie and allergy-bullying drama, it’s quite nice to have a chocolatey distraction.This recipe is dairy free, egg free and nut free – fantastic! – but unfortunately the recipe isn’t gluten free…at least not yet! When I’m baking with friends we always work out how to make the recipe so that it is free from everything I can’t eat. I’m usually the difficult one :p. This recipe is doing pretty well so far, but just the gluten needs adjusting. So how can we do that? What you’ve got to know about gluten free flours is that they can be very thirsty and that makes the batter dry. For brownies you want them to be moist and gooey. You can’t always exchange gluten containing flour weight for weight with gluten free flour. What I have found useful as a guide, is reduce the total flour weight by a third. For example if the recipe calls for 1 cup of flour I use 2/3 cup of gluten free flour. Or if the recipe calles for 90g flour I use 60g of gluten free flour. I add a little at a time and stir. This way if I can monitor what is actually the right amount. If the batter is a little dry, then I add a touch of water to loosen up the batter. You can use any pre blended gluten free flour mix you can find in the shops such as Dove’s Farm or Bob’s Red Mill, but my favourite by far is Free From Fairy’s Gluten Free Flour blend , you’ll need the plain flour for this recipe! For dairy free (and nut free!!) chocolates my favourite brands are Plamil and Cocoa Libre. Oh! and don’t forget the Splenda! When you’re buying ingredients, make sure you always check the ingredients and for allergy warnings to make sure products are safe for you! Allergy safe baking is all about having a go. It may seem daunting at first, but you can always have fun, not to mention treats at the end! Get your friends and family involved or bake up a batch of these brownies to share. 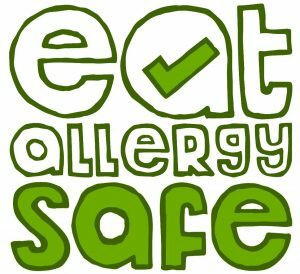 The more your friends and family get used to allergy safe, the more you’ll show them it’s easy and absolutely delicious! Have an amazing time in the kitchen and enjoy your luscious brownies! In bowl over simmering water, heat the chocolate until melted, stirring occasionally. Remove from heat. Whisk in SPLENDA® Granulated until smooth. Whisk in the mashed banana and vanilla. Mix flour with baking powder; stir into SPLENDA® Granulated mixture in two additions just until combined. Fold in dairy-free chocolate chips and cherries. Spread in greased 8-inch (2 litre) square metal cake pan. Bake in 180°C oven for about 25 minutes or until cake tester inserted in centre comes out clean with a few crumbs attached. Let cool; cut into squares. These looks yummy…can’t beat a brownie! These look divine, brownies are my favourite!